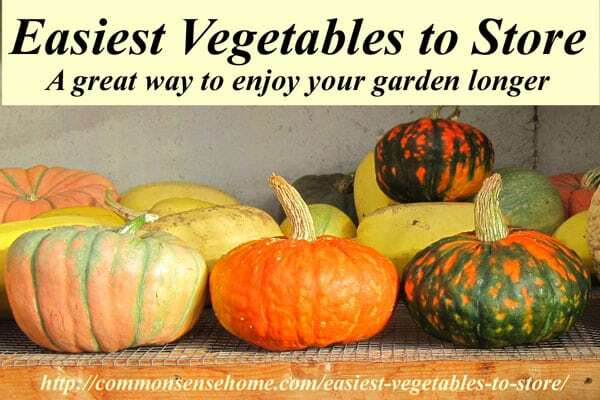 In this post I'll discuss the easiest vegetables to store and how to store them. These crops have all moved onto my “must plant” list because they require little or no processing and last reliably in storage for months. I also have a quick video of our awesome new root cellar makeover. August and the boys did a great job adding a ton of storage to the root cellar under our front porch. In my experience, strong flavored yellow onions tend to keep the best, followed by reds and then whites. Sweet onions have the shortest shelf life. We love onions! So many of our favorite recipes start with a pan full of sauteed or caramelized onions that I plant several hundred onions each year. Just the smell of them on the stove top can bring the boys into the kitchen saying, “mmmmmmm”. Onions like it cool and dry, so I generally keep them on the middle shelves of the root cellar. We cure ours in the greenhouse and trim off the tops before storing in the root cellar. Just pull, cure, brush off dirt and they're ready to go into storage. 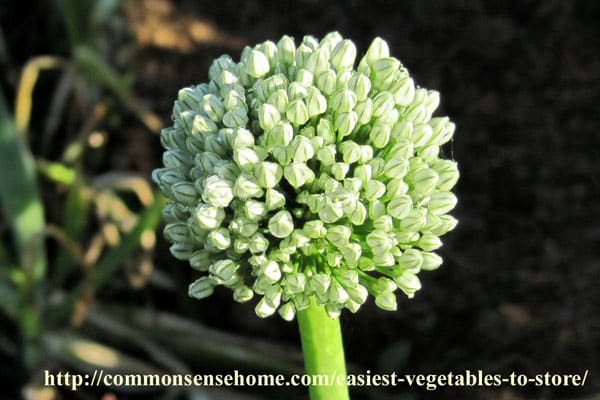 They can sit out on your kitchen counter for a while, but the warmth will get them sprouting. If your storage is really dry they'll start looking like a shrinky-dink, but you'll notice that they're comfortable at the upper end of what humans find comfortable, too. Our generally last from one season to the next, even in less than perfect conditions (our root cellar tends to stay a little warm). 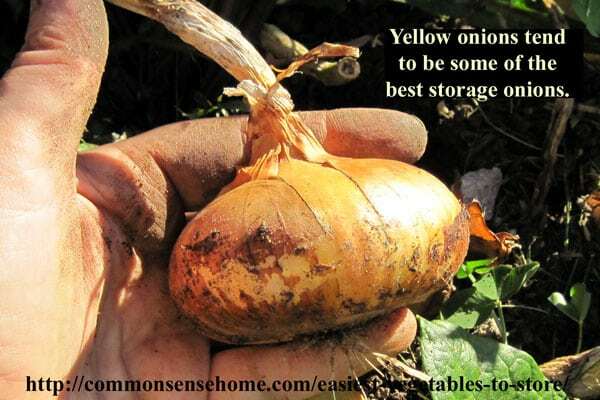 You can learn all about onion storage in the post “How to Harvest, Cure and Store Onions – Root Cellaring, Braiding, Dehydrating and Freezing“. If you see something like this at the top of your onion, don't try to cure and store it. This is a blossom, and the onion will rot instead of curing. You may still remove the center shoot and cook as usual, dehydrate or freeze. Like their onion cousins, garlic bulbs keep best in cool, dry storage. They are also easy to grow, as long as you have good soil. Plant a clove in fall, harvest a whole bulb the following summer. Now that I grow my own, I always have a bulb or two on the counter ready to use, while the rest hang out on one of the middle shelves in the root cellar. 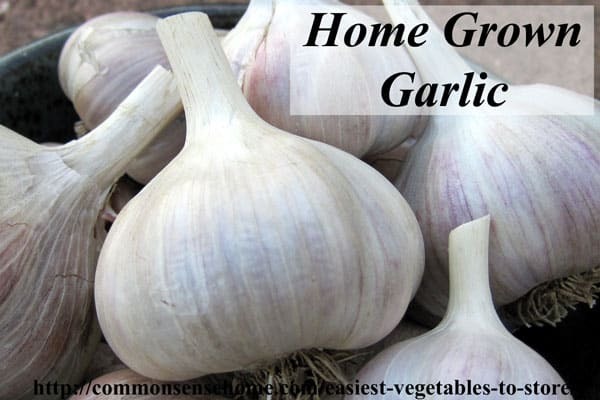 For more garlicky goodness, visit “How to Grow Garlic – From Planting to Harvest“. There's still time this fall (as of 9/25/14) to plant this year for a crop next year. Although they are cooked like a starch, shell beans originate as a vegetable, so I group them together with other storage veggies. Like onions and garlic, they prefer cool, dry storage. (See a trend here?) They have an even wider range of acceptable temperatures, making them a great preparedness item to keep stashed in a cooler bedroom, closet or pantry as part of your long term food storage. Scientific studies on vitamin loss in dried beans during prolonged storage could not be found. The loss would be expected to follow similar patterns as other long term stored foods where vitamin degradation occurs after 2-3 years and most vitamins are no longer present after approximately 5 years. Storage at warm temperatures will accelerate vitamin degradation. The other nutritional components (proteins, carbohydrates, minerals, etc) should remain unchanged during long term storage. From personal experience, after 2-3 years in simple mason jars storage (clean beans placed in jar with lid screwed on, no vacuum storage or oxygen absorbers) the beans cook just fine. Beyond that, they start to get a little dry and tough and some just don't get tender no matter how much you cook them. I like to rotate my stock regularly, so I don't worry about it too much, but for longer storage I'd definitely use oxygen absorbers and a hermetically sealed container. “How to Harvest Shell Beans” covers bean harvesting and preparing dried beans for eating, along with a couple of my favorite bean recipes. Depending on the variety, cured winter squash will last anywhere from a month or two “as is” to the better part of a year (6-8 months). A general rule of thumb is that the thicker the skin, the longer it will last in storage. If it takes a hack saw or hatchet to break in, you've probably got a good keeper. When you're picking your squash, cut it from the vine and keep the stem intact. Don't drop it or break the stem – bruises and stem wounds turn to rot. Let it ripen thoroughly on the vine. The skin should be firm enough that you can't dent it with a fingernail. If hard frost or snow is threatening and you know your squash won't have enough time to ripen, you can pick it green and use it like an overgrown zucchini. (You can pretend your Ma Ingalls and make a mock apple pie.) Hard frost will damage the skins and cause spoilage. To cure fully ripened squash, place them in a warm, dry location with good air circulation for one to two weeks. This dries them out and toughens up their skins. Because the pores on the skin of the fruit shrink during curing, it also slows the respiration rate of the fruit – which means it rots more slowly. Don't bother curing acorn squash – it makes them stringy. Once cured, I wipe off any major dirt balls and place into storage on one of the higher root cellar shelves, on the basement stairs, or on the floor of the canning pantry. 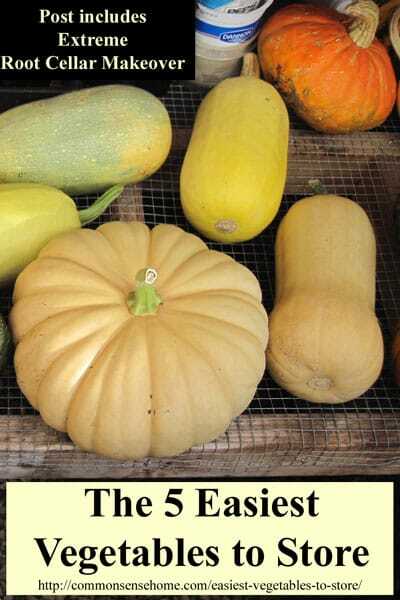 Winter squash likes it a little warmer than the other veggies – 50 to 55 degrees. Grocery store parsnips are a rather sad looking vegetable, trimmed down and heavily waxed to keep them from shriveling as they sit, often ignored, in an out of the way corner of the produce section. Garden parsnips are a springtime star, providing one of the first harvests of the season when few other fresh vegetables are available. We harvest roots planted in mid-spring of one year very early in the spring of the next year. My preferred method of parsnip storage is to leave them right where they are growing in the garden, covered by a heavy layer of straw mulch. In springtime, as soon as the ground thaws, we dig them out of their winter den. Quite a few are eaten immediately – my eldest LOVES parsnips, so digging day is also Parsnip Feast Day. Roots that are not eaten immediately after digging are washed and the tops trimmed to around 1/2 inch (if needed – you want to dig before they start growing too much). They will easily keep in the crisper drawer of the fridge for a month or so, if they last that long. Other root vegetables I tried to overwinter here in Wisconsin ( carrots, potatoes, beets) have all rotted after the freeze/thaw cycle, but parsnips just get sweeter and more delicious. 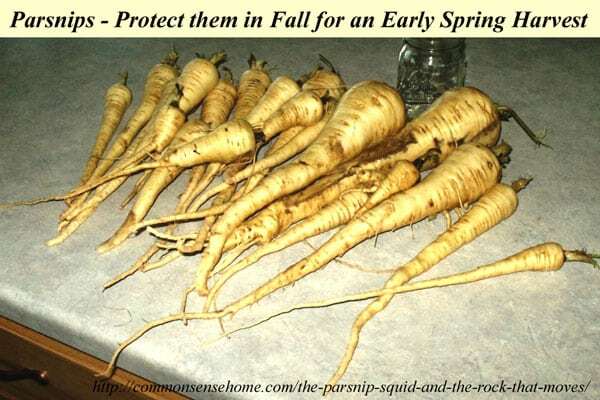 You can see photos of our parsnip stash and harvest in the post, “The Parsnip Squid and the Rock That Moves“. There's a reason that Native Americans grew the Three Sisters (Shell Beans, Dried Corn and Squash) as a traditional companion planting. 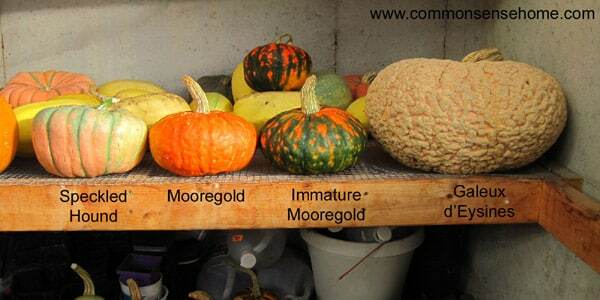 Besides complementing each other in the garden, all three crops also store very well. Flint (Zea mays indurata), also known as Indian corn, is harvested at full maturity when the head are dry on the stalk. Popcorn is a type of flint corn. 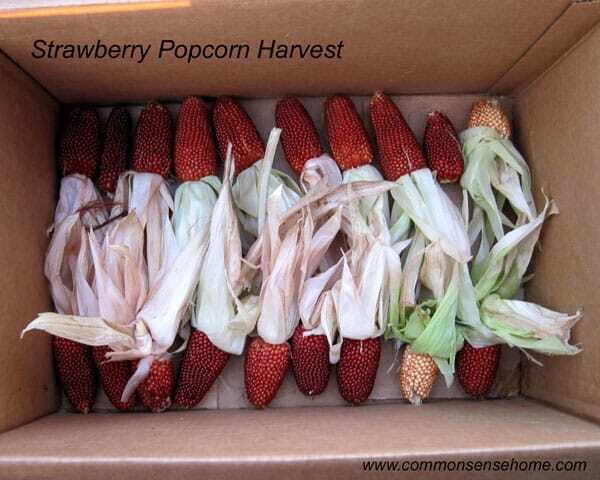 Simply wait until the green has faded from the husk of the corn cob, pick, pull back husks and allow to dry thoroughly. I spread my popcorn out in boxes. Often the corn is bundled by the husks and hung to dry. Note: Flint corn is not the same as Sweet corn (Zea saccharata or Zea rugosa). Once the corn is completely dry, you can shuck it and place the kernels in an airtight container for longer storage. As I mentioned at the top of the post, August and the boys did an extreme root cellar makeover this summer. I now have built in canning shelving on two walls, plus heavy duty shelving on the other two walls, and wine racks! It's a pretty luxurious change from the original rough cut lumber set up on concrete blocks. You may also enjoy our full list of over 40 Gardening Articles on the site. I grew spaghetti squash for the first time this year….we ate them all already, so no saving them, but I definitely had to bake them for a solid 30 minutes before I could cut it, scoop out the seeds, then stick it back in the oven for a bit longer…they could have withstood a nuclear blast. They tasted amazing once we got to the good stuff! Just a tip on cutting winter squash-I use a BIG knife and a rubber mallet and while I usually cant cut it exactly in half, its still cut and easier than any other method I have tried over the years.